Following the footsteps of the social media giant Facebook, LinkedIn recently added a new feature emphasizing visual content. Now, in addition to an in-depth, written summary of professional experience and accomplishments, LinkedIn users can upload visual media to their profile in order to better express their talents. The visual media, ranging from photo, video, and Powerpoint presentations to PDFs can be uploaded anywhere in the profile. Users can enhance their professional story by uploading visual media on their summary, work experience or education sections. The visual content application might be different from one user to another because "no two professionals are alike." 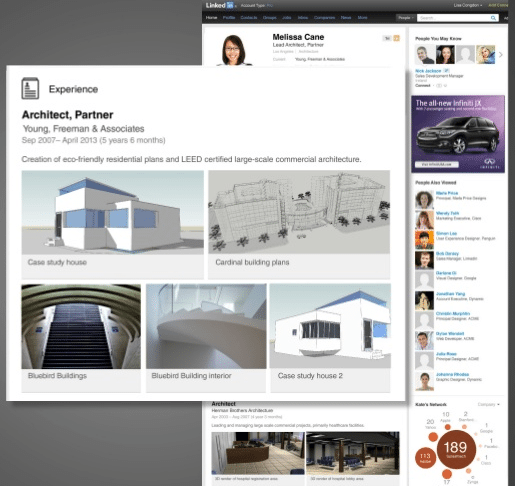 As in the snapshot of the LinkedIn profile above, the user uploaded pictures of a building plan and design to better showcase her works and professional skills. Meanwhile, compelling sales or product demo videos might work better than product pictures for a Sales Rep. Consequently, an Author might want to display pictures of books published while a Website Designer showcases web design portfolios. The end goal is to create a unique profile that truly showcase one individual's professional story. Visual media can be uploaded from either hard disk or web. There is no limit to the number or media displayed on a profile. The commenting feature is enabled on the media, while the share feature is still under development. However this new media-rich profile is currently available only in English-speaking countries. - Leverage new media-rich profiles by showcasing your company's product or expertise. Choose the best media to communicate your strength. Display product demo videos, whitepapers, presentations, infographics, case studies, free e-books or simply everything! - Reorganize your LinkedIn profile - put strongest skill or most impressive accomplishment at the top, right after summary to gain more attention. Finding it tough to keep up with the social media updates? Let SMD do the hard work.